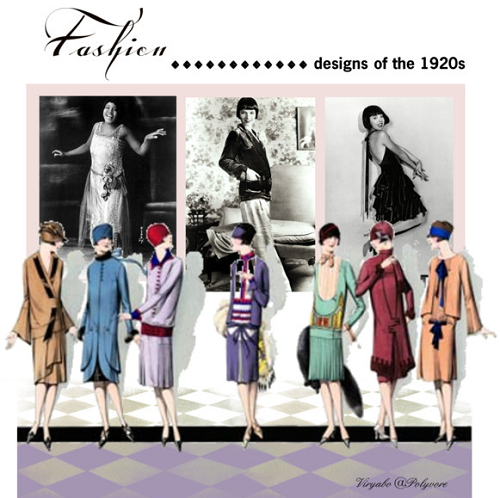 For the fashionable and fashion designers, it was the decade of the roaring 20s and the jazz age, with fashion apparel and accessories that included cloche hats; Art Deco evening dresses, high heeled footwear, bobbed hairstyles, exclusive casual clothes for women (leisurewear and sportswear). There was a lot of drinking, smoking, and partying, and it was so because it was a wonderful relief to deviate from those years of voluminous Victorian-style clothes, petticoats, and ‘rib-cracking’ corsets. In the twenties, fashion was finally becoming more relaxed with looser fitting clothes and defined by the camisole and chemise as undergarments, underwear that replaced the confining and tight-fitting corsets. Of all these top fashion designers, illustrators, and couturiers, Gabrielle ‘Coco’ Chanel, founder of the Chanel brand has the most lasting legacy of them all, continuing to be popular even until this day, 45years after her demise. Coco Chanel was and still remains one of the biggest names in the fashion and beauty industry. After being unsuccessful in finding work as a singer, she finally went into the fashion industry by opening a boutique called ‘Chanel Modes, in Paris. Coco soon became a famed fashion designer as she revolutionised the way women wore clothes, paving a new way for the fashion brand, she, being a fashion icon herself. Her simple but elegant styles changed the course of fashion history. Trousers for women – Her choice to wear sailor’s pants made the style spread so quickly, with her die-hard fans emulating her almost instantly. Little black dress (LBD) – Most women associate the little black dress with Audrey Hepburn because she wore it in the famous movie Breakfast at Tiffany’s. However, it was first designed by Coco Chanel in 1926. A calf-length simple black sheath, it was labelled “a frock that all the world would wear”. The style has become a wardrobe essential for every woman ever since. Suits for women – She created iconic suits for women, being inspired by menswear; specifically men’s suits. Jackets were collar-less with fitted sleeves, embellished buttons, and were cut stylishly boxy with an accompanying skirt that was slim-cut and trim. Chanel suits were very popular among famous celebrities like Grace Kelly and Audrey Hepburn. Quilt stitched handbags and ballet flats – Not unlike the ballet flats of today, one of her popular styles in footwear are the two-toned ballet style shoes and the quilted bags with chain straps that both continue to remain a staple in the fashion scene of today. Coco Chanel was known to favour mostly black and white colour combinations, especially stripes. Till date, some fashion designers of contemporary labels continue to introduce replications of her creations, fashion season after season. She was an Italian fashiondesigner and a great rival of Coco Chanel. 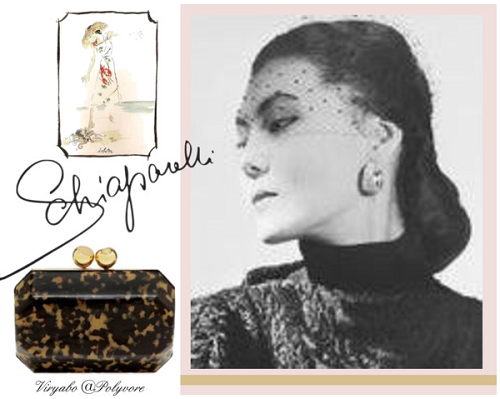 Regarded as one of the most prominent figures in the fashion scene between both World Wars, Schiaparelli's creations were influenced by surrealists like Salvador Dalí (a skilled draftsman and prominent Spanish painter), and Jean Cocteau (a French writer, filmmaker, designer, artist, and playwright). The wrap dress – Inspired by aprons, the design of the wrap dress was made to flatter the female silhouette. Originally conceived as women’s beachwear, the dress was popular as a design for everyday easy-to-wear clothing. The divided skirt – This style was really a forerunner of women shorts and it shocked the tennis world when worn by Lili de Alvarez at Wimbledon in 1931. 2-Piece evening wear - Evening gowns with matching jackets. Speakeasy Soiree dress – Popular during the 20s to 30s Prohibition era in the United States, the speakeasy dress was designed with a hidden pocket that was meant for a flask to conceal alcoholic beverages. Clothing with visible zippers - Zippers (zips) was a key feature of her fashion designs. They were made of some form of plastic, bold and chunky, visibly clasping dress necklines and running down sleeves, dresses, and even skirts. She designed wardrobes for a good number of movie stars including Zsa Zsa Gabor and Mae West. 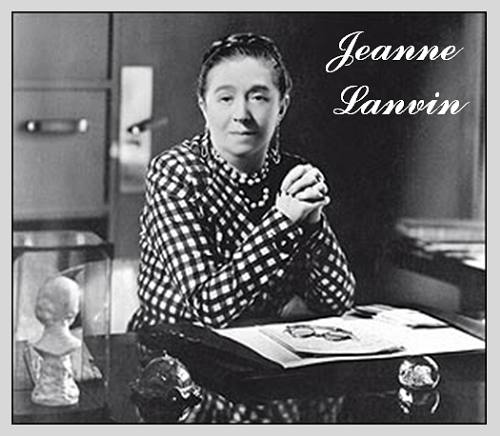 Born in Paris in 1867, Jeanne Lanvin who founded the Lanvin brand, was a French Haute Couture fashion designer who was not only famous in fashion designing, but was also the famous founder of Lanvin Parfums, a beauty company and perfumery. She is known to be the founder of the world’s oldest fashion house. She started on the fashion scene by being a milliner (hat maker) but soon became a fashion designer and couturier. Jeanne Lanvin designed wonderful clothing for her daughter Marguerite, something that inspired her on and was the actual driving force behind her design creations. The beautiful designs of the dresses she made for her daughter was so admired by women, there grew a demand for adult versions of such exquisite clothing. Lanvin soon after created clothing lines for women and young girls, becoming well known for her mother-and-daughter outfits. She loved to work with expensive fabrics and embellishments like delicate trimmings, embroidery, exquisite beadwork, ribbons, ruffles, lace, mirrors, and flowers. Jeanne also used ornamentation such as appliqué, quilting, 'couching', pearls, corals, tiny shells, and sequins. Unfortunately, she didn’t have a public/limelight image like her industry rival Coco Chanel who self-promoted her fashion designs. Karl Elberfeld once wrote about her . . . “Her image wasn’t as strong as that of Chanel because she was a nice old lady and not a fashion plate”. The House of Lanvin is still very much alive today, going from strength to strength. Indeed, a wonderful legacy for a talented fashion designer. 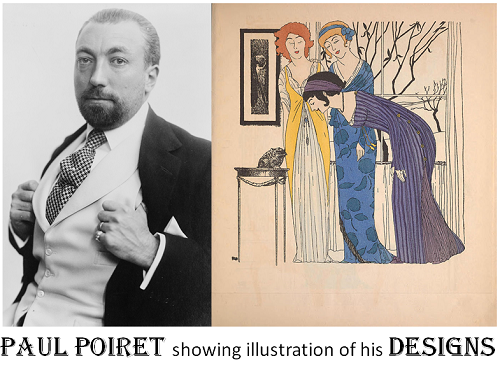 Probably the most fashion conscious of the early 20th Century fashion designers, Paul Poiret was particularly noted for his neoclassic and ‘oriental-ish’ creations with clothing designs that are cut along straight lines and rectangular motifs. The structured cuts represented a beginning of ‘modern fashion’, something quite welcomed, especially after the era of women clothing that always required wearing voluminous dresses with constricting corsets. He was actually more popular in the first decade of the 1900s, more than he was in the 1920s when his popularity started to wane. Poiret was particularly noted for reviving the empire style and advocating the replacement of corsets with the ‘modern’ bra. His clothing still features prominently in the collections of fashion museums worldwide. Relatively unknown but very talented, Florrie Westwood is who we can describe today as a fashion illustrator. As a London fashion designer who was very active in the early 1900s, not much is known about her apart from the fact that she creates wonderful designs through her drawings which were mainly elegant high-end conservative styles. Westwood’s fashion drawing illustrations emphasised the new fashion of the time . . . the linear silhouette and ankle length clothing. The coat designs also showed the new shape, a higher neck covering and greater shoulder coverage of fur collars and cuffs. There were hundreds of now-anonymous dressmakers and designers like Florrie Westwood who existed in towns and cities across the country until the mid-20th-century when mass-produced ready-made (ready-to-wear) clothing came to dominate the fashion scene. Though Madeleine Vionnet was a popular name in the 1920s fashion industry, however, unlike Coco Chanel who is still popular until this day, she is no longer a household name. Born in 1876, Vionnet was a French fashion designer who got her training in London but returned to Paris to start her fashion house in 1912. After the First World War, she soon became one of the top French fashion designers of her time, up until the late 1930s. Her signature creations showed a woman’s natural silhouette, unlike earlier fashion styles that rather than flatter a woman’s body distorted her shape. Grecian style dresses – Popularly referred to as the "Queen of the bias cut" Vionnet is best-known today for her elegant Greek style dresses (she was inspired by ancient Greek art) and for popularising the bias cut. 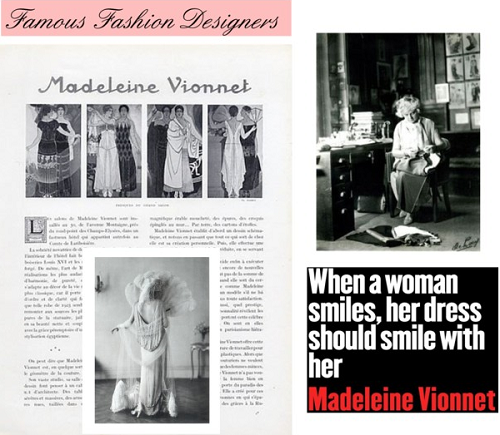 As an expert couturier, Madeleine Vionnet designed her dresses with the bias cut, aiming to create sleek, body-flattering, body-skimming apparel that eventually revolutionised women's fashion, thus careening her to the top of the fashion world and making her one of the most famous fashion designers of the 1920s and 1930s. She is credited with inspiring a number of today’s fashion designers with this unique design feature. She hardly changed her designs basically throughout her career as a fashion designer but by the 30s, the last decade of her profession, her dress designs became a little more closely fitted to a woman’s body. Patou was a perfumer, a debauchee, and fashion designer. He is recognised as the one who invented the "designer tie" in the 1920s and his famous cubist cardigans with matching hats, scarves and gloves. 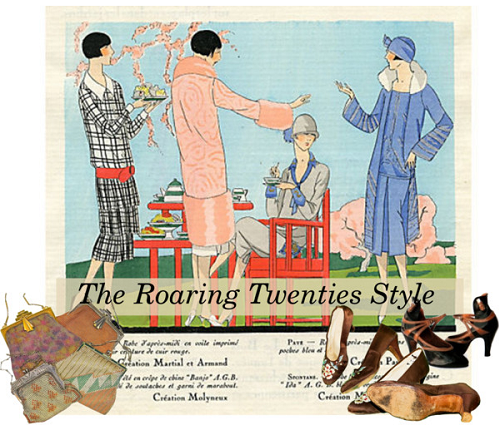 These two creations were some of the most popular trends of the 1920s. The designer tie is simply men ties made in the same fabric as the women's dress collection. The style is still prominent among modern fashion designers like Timmy Everest (a bespoke tailor and designer from Wales), Paul Smith (a famous British fashion designer), and Louis Féraud (a French artist and fashion designer). Patou marketed his clothes mostly to the rich but with the stock market crash affecting the purses of the wealthy more than most; the House of Patou continued to survive through its perfume production. Sportswear – In comfortable yet stylish designs that personified the fashionable "new woman” . . . those who wanted to look stylishly sporty, even if they did not participate in any form of exercise. His evening wear was usually made in Georgette crêpe and beaded, delicately embroidered, or embellished with fine lace. 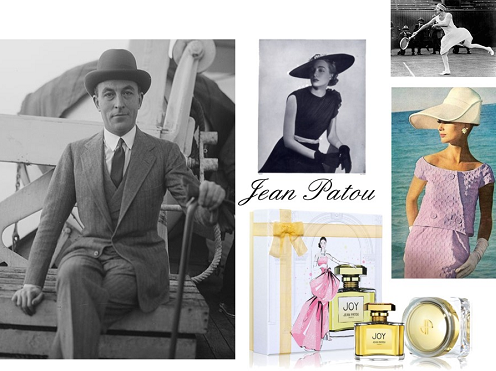 In the mid-20s, Jean Patou started a perfume business which is still thriving and well-known even to this day, eighty years after his demise in 1936. His early death made him one of the most undervalued but famous fashion designers of all time.